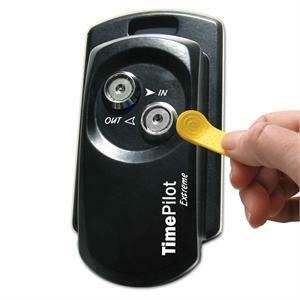 TimePilots new rugged Extreme system is designed for outdoor use, although it can be used inside, too. It commonly would be used at construction sites, where the clock is exposed to the elements. The clock is locked down to prevent theft, but can be moved easily to another site when necessary. The clock is mounted and locked using the secure monuting plate and padlock. Automatic tracking and calculation of regular time and overtime. Supervisor plugs USB drive into computer with TimePilot software to import data into system.